The Hussain brothers are talented composers who have created original music for serials, plays and documentaries. How many ghazal singers can claim that they have performed before the President of India. Besides that, how many can claim that their records have been released by the Prime Minister of India? The famous Hussain brothers can claim this success. Ustad Ahmed Hussain and Ustad Mohammed Hussain can proudly claim that they have performed before President Shri Fakhruddin Ali Ahmed in 1976 and their records have been released in 1982 by the Indira Gandhi. The Hussains started their musical training in 1958, developing their natural talent and god-given talent. They honed their talent for vocal classical music by following a scrupulous disciplinary regimen. They have effectively applied the curative spiritual powers of their music to help heal cancer patients, the blind and physically challenged. The brothers have also performed to raise money to help in event of natural calamities such as earthquakes, flood and famines. They look upon music as a humanist endeavour and a curative power and not as a pursuit whose end is merely commercial entertainment. The Hussains brothers are also talented composers who have created original music for serials, plays and documentaries. They have performed all over the world. Their popularity and versatility can be judged from the two facts. Firstly, devoted fans have started their Fan Club in Long Island, New York, USA. Secondly, they have little over 50 albums to their credit such as Guldasta, Meri Mohabbat and Dasam Granth. Lauded and admired, the Hussains are rightly viewed as honoured citizens in today’s musical world. 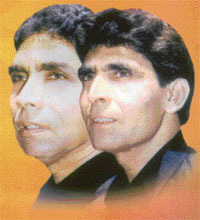 The king of romance Yash Chopra forced the Ustads to sing in his blockbuster Veer-Zara. The famous qawwali which was picturised on Shah Rukh Khan and Preity Zinta at Dargah of Sufi Saint will continue to haunt the admirers of Hussain brothers for years to come.